I have re-watched The Force Awakens after going to see The Last Jedi. In TFA, Rey has a vision of Luke's Jedi school in ruins with the Knights of Ren standing in the ashes. Luke goes to kill Ben in his sleep sensing his growing darkness, but can't bring him self to do it. But Ben wakes up and defends himself (not with a red lightsaber), takes some students with him (the Knights of Ren), kills the rest and destroys the school thinking Luke is dead. 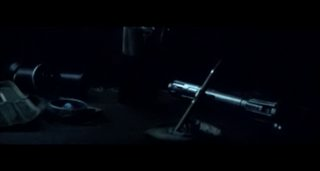 In the image it shows Ben in his Kylo gear and with his red lightsaber, how did he have this at Luke's school? Visions are hard to interpret, especially when clouded with the dark side of the Force. It's not clear whether Rey is seeing the past, the future or some kind of jumbled mish-mash of conflicting images. As you've pointed out, Kylo didn't get his snazzy hat and red lightsaber until after he'd fled the training grounds. He was still using a standard lightsaber when he and his like-minded acolytes razed the Jedi Temple and left. The Temple was destroyed by the "Knights of Ren" but again we learn that these knights were almost certainly other Jedi trainees, not a force of highly colour-coordinated warriors. 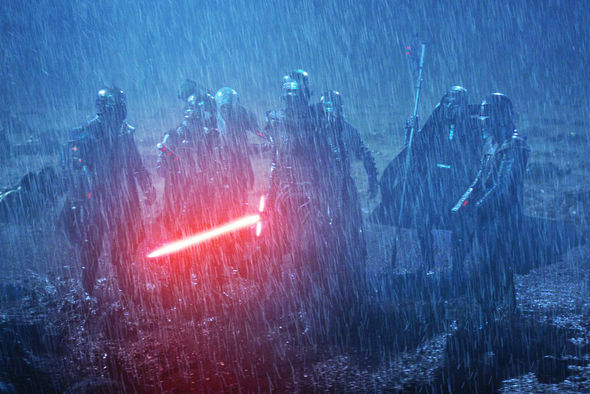 Rey's vision appears to be conflating two or three different timelines; The razing of the temple and an older Kylo Ren standing with his Knights of Ren. 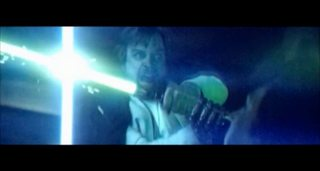 Luke tried to attack already-turning-dark Ben, with a lightsaber (while asleep), and Ben parried that attack. The memory was confirmed by Luke to Rey later, in a memory that had the same exact images. ... so it's not a fake/error. 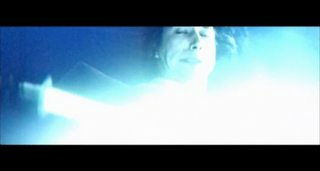 Please note that the original Forceback (Rey's vision) had image of Kylo Ren in his "not-Sith" uniform already; whereas the day of the destruction of Luke's Temple academy, he was still dressed as one of the students; therefore it was clearly a vision of a different, later event. The vision was provided by the Force, but it is unlikely for a vision to provide images pixel-by-pixel. A vision probably supplies thoughts, ideas, descriptions of events, and the mind of the person receiving the vision fills out the blanks. so, if the vision states Kylo doing something, Rey will probably see Kylo with the gear she last seen him wearing. Not the answer you're looking for? Browse other questions tagged star-wars the-force-awakens the-last-jedi kylo-ren or ask your own question. Is there any evidence that Rey was imagining Luke's island? By the end of The Force Awakens, who knows about Kylo Ren's family? Which of these two events happen earlier? Was Kylo Ren Manipulating Snoke? How Kylo Ren knew Rey before Star Wars: The Force Awakens? Did Leia know Luke's true nature? Did Luke know about Kylo Ren's obsession with Darth Vader?